In amongst the exuberant herbaceous borders and hot, tropical plantings of The Salutation in Kent there were also some carefully considered planting combinations to be found. I particularly liked this very photogenic pairing of Echinacea “Fatal Attraction” and an undentified ornamental grass, perhaps a species of Stipa. 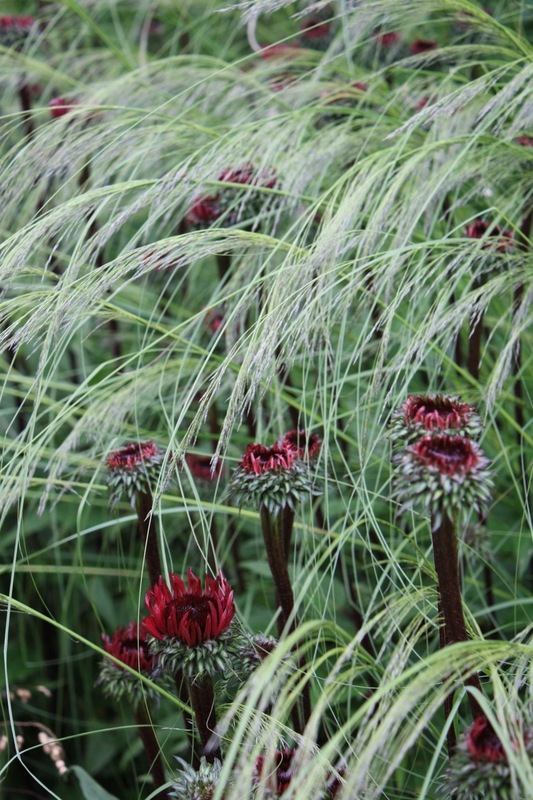 The dark stems and blood-red flowers of the Echinacea looked really dramatic against the fragile, pale grass. 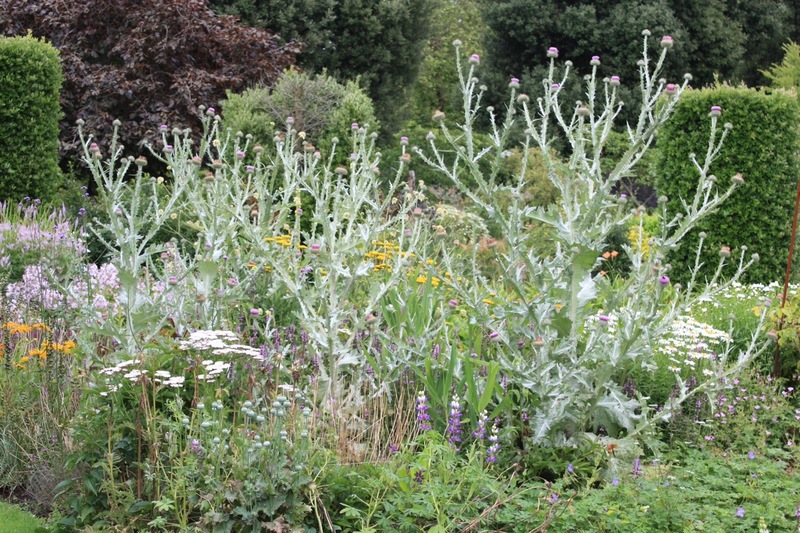 More subtle, and very Jekyllian, was the soft silver planting in the middle of one herbaceous border. 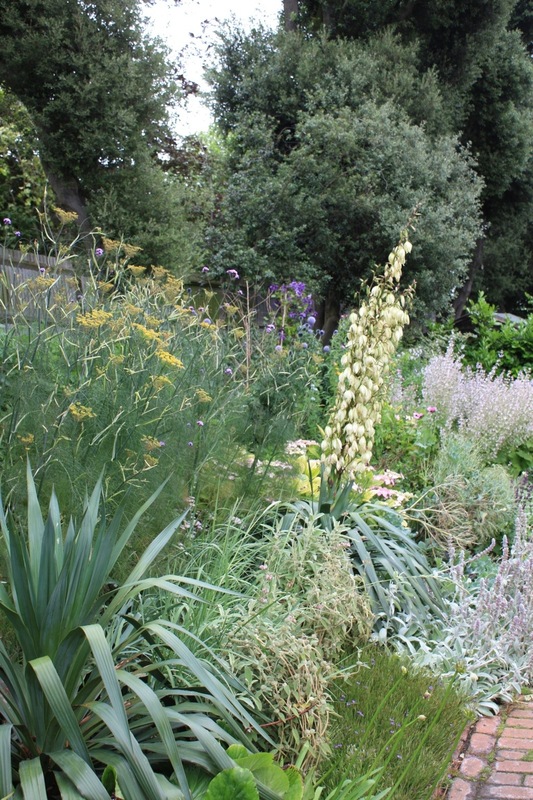 This included Salvia sclarea, fennel (Foeniculum vulgare) and globe thistle (Echinops ritro), punctuated by Miss Jekyll’s favourite architectural plant Yucca filamentosa. In the foreground is reliable Bergenia and starry flowered Sissyrinchium bellum. 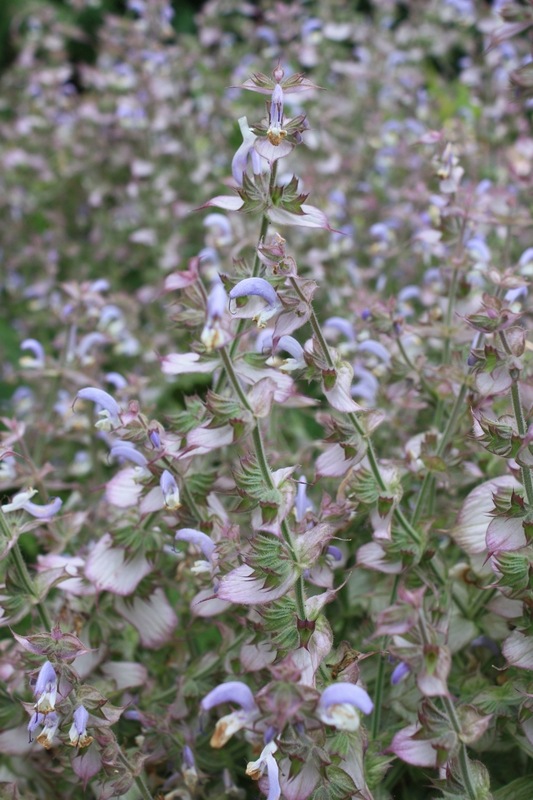 Salvia sclarea or clary sage, pictured above, is an unusual biennial or short-lived herbaceous perennial native to the northern Mediterranean. Usefully it is also the source of a medicinal essential oil. The translucent, pink-tinged bracts create a delicate foil for the pale lavender flowers and make a big statement in the garden. Bees also love it. Where were they when I needed them for this shot? 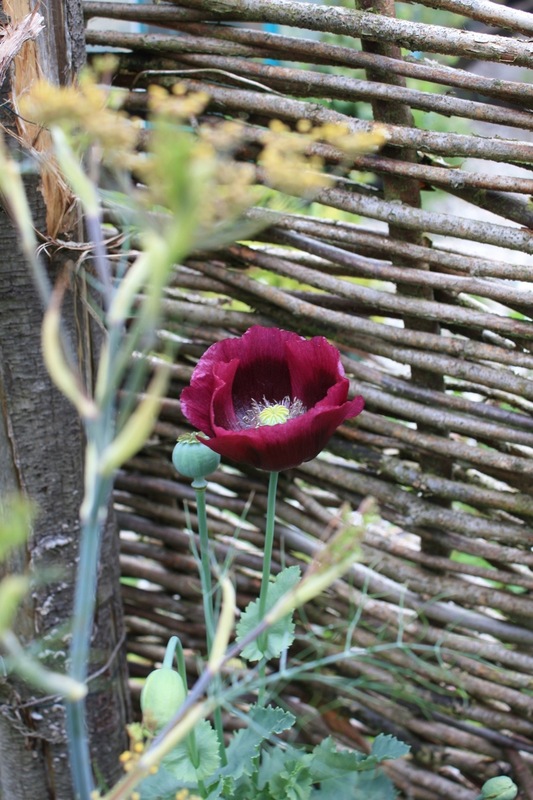 We spotted this lovely blackcurrant coloured opium poppy (Papaver somniferum) in the luxuriant vegetable garden, set against a willow hurdle. Opium poppies are marvellous annuals, seeding and flowering freely in a wide palette of colours from white through to deepest purple. In my parents’ garden the mauve version used to romp around and appear year after year, as reliable as the Aquligeas, Alchemilla and Pulmonaria which also used to scatter themselves everywhere. Lastly, in front of the main facade, was this flamboyant planting of cardoons, Achillea, lupins, herbaceous geraniums and more opium poppies, only their seed heads left on show. This kind of planting needs space, but if you’ve got it, why not? Nearby was another of my favourite plants Berkheya purpurea. 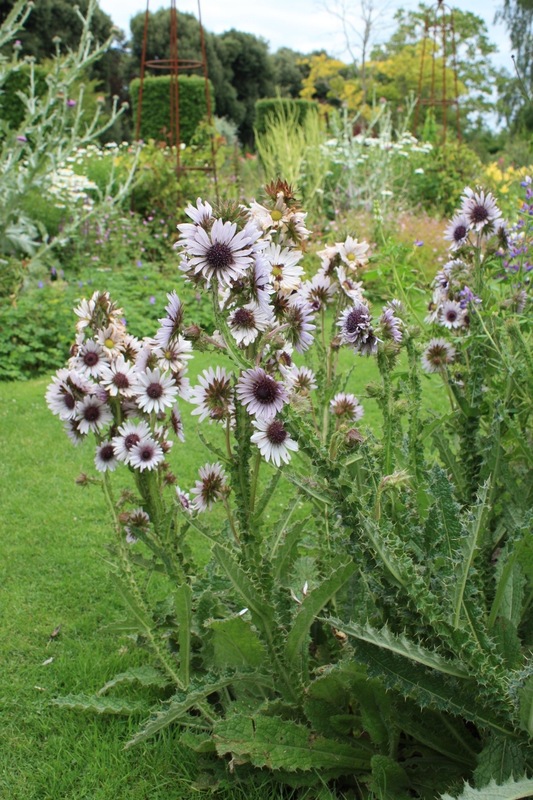 Like cardoons, Berkheya is an extraordinary plant with jagged leaves and amazing flowers which go on all summer. It is easy to grow from seed but likes sun and good drainage to do its best. These were looking very happy indeed, despite all the rain. Not something to brush past with bare ankles! I’ve never seen Echinacea “Fatal Attraction”. That is indeed stunning with the grasses. It is also not a combination that I would have thought to put together. Very interesting. The giant tree looking thing, with brances. Is that opium poppies as well? They look like they have thorns.Do some opium poppy varietys have prickers? I’m talking about the giant plant in the background, not the close up shot. Hi Malcolm. I think you are referring to the Scotch thistle, Onopordum acanthium, which is the national flower of Scotland and very prickly indeed!